UPDATED: Fri., June 1, 2018, 3:08 p.m.
At Pocono Raceway, Long Pond, Pa.
1. (12) Ryan Blaney, Ford, 176.897 mph. 2. (4) Kevin Harvick, Ford, 176.807. 3. (1) Jamie McMurray, Chevrolet, 176.626. 4. (78) Martin Truex Jr., Toyota, 176.516. 5. (18) Kyle Busch, Toyota, 176.478. 6. (41) Kurt Busch, Ford, 176.208. 7. (22) Joey Logano, Ford, 176.184. 8. (31) Ryan Newman, Chevrolet, 175.864. 9. (14) Clint Bowyer, Ford, 175.798. 10. (11) Denny Hamlin, Toyota, 175.792. 11. (9) Chase Elliott, Chevrolet, 175.230. 12. (3) Austin Dillon, Chevrolet, 174.689. 13. (42) Kyle Larson, Chevrolet, 174.676. 14. (88) Alex Bowman, Chevrolet, 174.490. 15. (48) Jimmie Johnson, Chevrolet, 174.365. 16. (24) William Byron, Chevrolet, 174.253. 17. (2) Brad Keselowski, Ford, 174.213. 18. (19) Daniel Suarez, Toyota, 174.115. 19. (43) Darrell Wallace Jr. , Chevrolet, 173.708. 20. 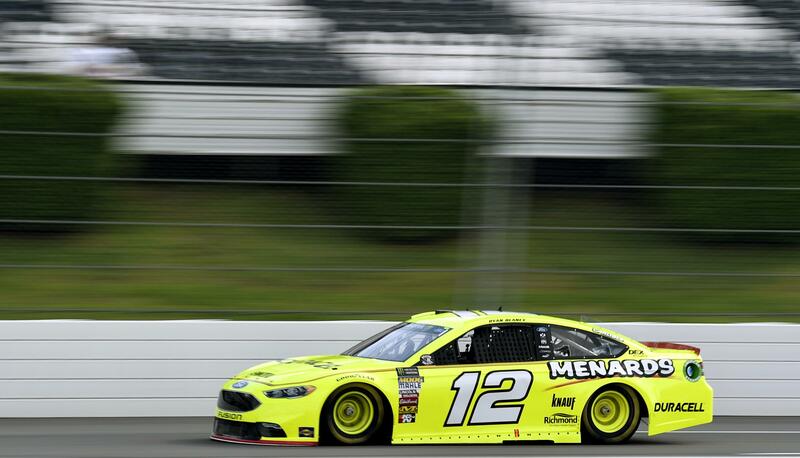 (21) Paul Menard, Ford, 173.635. 21. (38) David Ragan, Ford, 173.297. 22. (95) Kasey Kahne, Chevrolet, 172.997. 23. (17) Ricky Stenhouse Jr., Ford, 172.473. 24. (47) AJ Allmendinger, Chevrolet, 173.054. 25. (20) Erik Jones, Toyota, 172.808. 26. (6) Matt Kenseth, Ford, 172.612. 27. (37) Chris Buescher, Chevrolet, 172.457. 28. (51) Cole Custer, Ford, 172.424. 29. (13) Ty Dillon, Chevrolet, 170.914. 30. (34) Michael McDowell, Ford, 170.768. 31. (15) Ross Chastain, Chevrolet, 170.107. 32. (32) Matt DiBenedetto, Ford, 168.685. 33. (00) Landon Cassill, Chevrolet, 168.297. 34. (10) Aric Almirola, Ford, 167.115. 35. (72) Cole Whitt, Chevrolet, 167.032. 36. (23) Gray Gaulding, Toyota, 166.892. 37. (7) JJ Yeley, Chevrolet, 166.868. 38. (99) Derrike Cope, Chevrolet, 164.375. All grown up, he’s figured out the real deal pretty well. Blaney was tops again at the site of his lone NASCAR Cup victory, turning a lap of 176.897 mph to win the pole Friday at Pocono Raceway. He won his first career Cup race in the June 2017 race driving for Wood Brothers Racing, then partied all night with Dale Earnhardt Jr., Darrell Wallace Jr., and a few other tight NASCAR running buddies. Blaney might want to put the beer back on ice. Blaney’s fourth career pole puts him in position to repeat and earn an automatic spot in NASCAR’s playoffs. He gave the famed Wood brothers their 99th career win last season, a ride strengthened by an alliance with Team Penske. Roger Penske wanted the 24-year-old budding star in his NASCAR stable and put him in the No. 12 Ford this season. Blaney, son of former NASCAR driver Dave Blaney, grandson of dirt track star Lou Blaney, has led 418 laps this season and is 11th in the points standings. Kevin Harvick, who leads the series with five wins, joins Blaney on the front row. Jamie McMurray, Martin Truex Jr., and Kyle Busch complete the top five. Harvick is a whopping 0 for 34 at Pocono and stands with Kentucky as the only active tracks where he’s failed to win a Cup race. He’s getting closer to the checkered – Harvick was runner-up in both 2017 Pocono races. He expected to race for the win again on Sunday. “These guys have given me fast race cars every week,” Harvick said. Harvick and Busch have won nine of 13 Cup races this season and each have earned enough playoff points that they’re already stout favorites to race for the championship in the season finale at Homestead. The one thing Harvick and Busch haven’t done this season? Race each other hard down the stretch for either of their victories. The 18 vs. 4 battle for the victory has yet to truly materialize. Consider, Harvick was 40th last week at Charlotte Motor Speedway as Busch celebrated his fourth win of the season. Harvick sensed it was only a matter of time until the two top drivers this season had a 1-2 finish. “It is kind of weird that we really haven’t mixed it up for an entire race,” he said. Published: June 1, 2018, 2:25 p.m. Updated: June 1, 2018, 3:08 p.m.